Despite his personal and legal problems in the last two decades of his life, Michael Jackson remains one of the most widely known and successful pop stars of all time. Commercially and critically Jackson, both solo and with his brothers in The Jackson Five, dominated pop music charts and award shows for two decades. To this day Michael Jackson still has five of the top 200 best selling albums of all time. Michael Jackson was born to a poor family in Gary, Indiana on August 29, 1958. At a young age he and his brothers displayed a great musical talent. Michael Jackson’s father, Joe Jackson, helped his children form The Jackson Five. The group would become a popular opening act for national pop and rhythm and blues groups like The Temptations and James Brown. In 1969 The Jackson Five signed with Motown Records and released their first single “I Want You Back.” The Jackson Five followed with three more singles which all hit number one on the pop charts. After more successful records and a label change from Motown to Epic, Michael Jackson launched an acting career, starring in the all-black remake of The Wizard of Oz: The Wiz. While filming The Wiz, Jackson met producer Quincy Jones. Together they recorded Jackson’s solo debut for Epic Records, Off The Wall. This album, which sold seven million copies, became the most successful of any black recording artist. In 1982, Jackson would eclipse his own achievement when he teamed with Quincy Jones again to produce the groundbreaking album Thriller which would become, with twenty seven million copies sold, the second-most successful album in U.S. sales. Only the Eagles’ Their Greatest Hits, 1971-1975 with twenty nine million albums sold, was more popular. Globally however, Thriller is the only album ever to sell more than 100 million copies, easily making it the highest selling album in history. 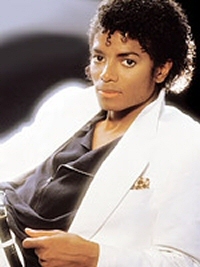 Jackson also swept the Grammy Awards in 1984, winning eight trophies. Jackson soon became as known for his James Brown-inspired moves as he was for his vocals. Jackson’s look, complete with a single white glove and signature “moonwalk,” made him the most recognizable figure of the 1980s. As Michael Jackson’s eccentric personality and legal problems began to earn more attention than his music in the 1990s, they never completely overshadowed the fact that he has been one of the most successful pop acts in history. He has won thirteen Grammy Awards. In 2001, Jackson was elected to the Rock and Roll Hall of Fame for a second time (the first was with the Jackson Five in 1997). Michael Jackson died on June 25, 2009 in Los Angeles, California. Eleanora E. Tate, African American Musicians (New York: John Wiley & Sons, Inc., 2000); Adam Woog, From Ragtime to Hip-Hop: A Century of Black American Music (Detroit: Lucent Books, 2007); Steve Huey, "Michael Jackson," Allmusic.com 14 Mar. 2007. http://allmusic.com/cg/amg.dll?p=amg&sql=11:aex1z83ajyv5~T1. Eleanora E. Tate, African American Musicians (New York: John Wiley & Sons, Inc., 2000); Adam Woog, From Ragtime to Hip-Hop: A Century of Black American Music (Detroit: Lucent Books, 2007); Steve Huey, “Michael Jackson,” Allmusic.com 14 Mar. 2007. http://allmusic.com/cg/amg.dll?p=amg&sql=11:aex1z83ajyv5~T1.